"Somehow if the president puts Russian dressing on his salad there's a connection to Russia." — Instant Spicer classic. Unfortunately for Spicer, he wasn’t the first to reference salad dressing in claiming the Russia story is overblown. That honor goes to Twitter’s resident Republican bad joke maker, former Arkansas Gov. Mike Huckabee, who made the same zing earlier on March 3. Stealing jokes, of course, is the worst sin of comedy. Accusations have battered and even ended the careers of notable comedians. Dane Cook was never the same after Louis C.K. accused him of stealing jokes. Accusations against comedian Carlos Mencia from the likes of George Lopez, Joe Rogan and “South Park” have caused him to more or less vanish from the public eye. 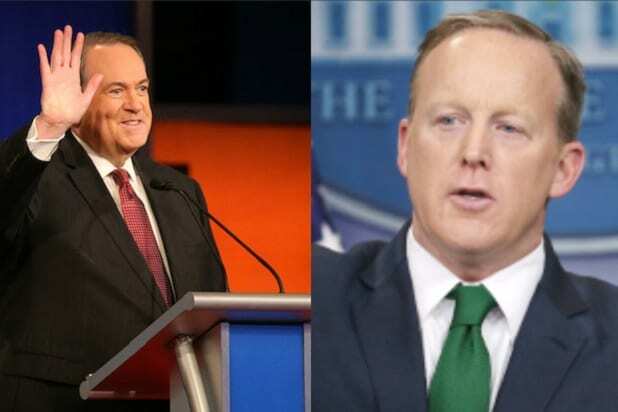 Spicer probably won’t lose his spot on TV for stealing from Huckabee. Then again, who knows how big a stand-up fan Trump is. The press secretary tried to use the joke to dismiss journalists’ tough questions on the Trump team’s connections to the Kremlin. Trump and the White House have repeatedly claimed there’s nothing to the story and that reports on it are “fake news.” Trump even tweeted about the FBI’s Russia investigation over the weekend, invoking his favorite targets, the Clintons. And Spicer might have been feeling good after his last notable joke, invoking Melissa McCarthy’s “SNL” impression of him, got laughs from the press and the Internet. But for Spicer, the joke didn’t go over well in the room. For Huckabee, the probable upshot of Spicer stealing his gag was that it bombed. In joking in hopes that it would make journalists seem absurd, Spicer probably wasn’t expecting Twitter users to pounce and drag him with even better ones. Spicer: If Pres used Russian Dressing that's a Russian connection. Many referenced the “Trump sandwich” restaurants around the world advertised during the election. And a whole lot of people noted that Russian dressing isn’t really for salads — it’s for sandwiches. Everyone knows Russian dressing goes on Reubens, not salad. What kind of cover-up is Spicer trying to pull? Then again, it’s well-known that Trump likes his steaks well-done with ketchup. So maybe Russian dressing (which has a base of ketchup and mayonnaise) is his kind of salad dressing. Huckabee, meanwhile, is well-known on Twitter for trying, and often failing, to make fun of his favorite targets — journalists and liberals, mostly. Other Huckabee food jokes include the one where he said federal judge Neil Gorsuch was answering senate confirmation hearing questions so well, he was turning democrats into pork sausage. Or something. Republican former Arkansas Gov. Mike Huckabee spends a lot of time on Twitter. He also obviously thinks he's very funny -- there's nothing in the news that's not worth an attempt at a rimshot from the Huck, especially when it concerns Donald Trump, the media, or liberals. Oscillating from bad dad puns to straight-up nonsense, Huckabee's jokes aren't just bad, they're often indecipherable. Here are 26 instances of really bad Huckabee jokes from the governor's Twitter feed. Huckbee had a great time watching the Senate Supreme Court nomination hearings for Neil Gorsuch. Maybe he was also thinking about breakfast when he sent this tweet. The Gorsuch hearing also reminded Huckbee of "Looney Tunes." Kind of a tough-to-follow reference for most people in trying to say "Democrats are dumb," but at least it's a pop culture joke some people know. Huckabee struggles in this area. ...things about poop. Huckabee thinks poop is hilarious. Huckabee enjoyed himself immensely watching Rachel Maddow's show in which she released part of Trump's 2005 tax return. Here he goes for a pop culture reference not quite as hip as Foghorn Leghorn. Here Huckabee weighs in on Snoop Dogg's music video that featured him wanting to shoot a caricature of Donald Trump. Note the brilliant comedic transposition of "Snoop" and "Poop." On Snoop, Maddow, et. al. Huckabee has the comedic chops to riff on multiple targets -- Maddow, Snoop, and Jimmy Hoffa for some reason. Repeatedly going after someone who uses the name "Dogg" might be ill-advised for Huckabee, though, as Twitter users pounced to remind Huckabee of allegations that his son tortured and murdered a dog. Like any true jokester, Huckabee also isn't above deploying a racist stereotype out of the blue and for seemingly no reason. Huckabee has spent quite a bit of Twitter time making light of the ongoing investigations into the Trump camp about interactions with Russia during and after the presidential election. The true highlight of the Russian dressing joke, however, was Huckabee's response to another Twitter user. That user made a joke about Huckabee's weight, saying he'd "never seen a f---ing salad." Huckabee clapped back in full dad mode. For another extremely timely reference in making fun of the Russia investigation, Huckabee goes to that old comedy standby, the kidnapping of Charles Lindbergh's son in 1932. On CNN being "fake news"
Another favorite target of Huckabee's is the media, and particularly CNN. He's fully on board the "fake news" train. Nothing, of course, is funnier than seemingly random Bible references. Other than ending a joke with "Bam!" so people know it's over, that is. CNN is "fake news," get it. Evidence suggests Huckabee hasn't come up with his own explanation of the CNN acronym that's nearly as funny as his idea for what BBC stands for. Also a quick reminder that it's boring and makes you sleepy. Like ambien, another sleep-related thing. Time Magazine, more like ... rhyme magazine, chime magazine, mime magazine ... oh! When he's not clowning the media, Huckabee is issuing sick burns against Democrats and liberals. Grab some ointment, this one needs medical attention. Oslo, Norway, was a long way for Huckabee to go to make this joke. But that's how dedicated he is to making fun of Democrat House Minority Leader Nancy Pelosi. Nailing liberals with science's proven funniest activity: pooping. Although Huckabee isn't a science fan, so maybe that's mentioned in the Bible somewhere. Apparently Mike is a fan of your elderly aunt's Facebook page. When the 9th Circuit U.S. Court of Appeals found Trump's travel ban against people from seven mostly Muslim nations to be unconstitutional, Huckabee was there to serve up some hilarious truth. A dunk on Democrats, fake news, and how liberals are all about feelings. Nailed it. Bam! We honestly don't know where he's going with this one. Sometimes, though, Huckabee doesn't need to stick it to anyone. Some days he just wants to make a good, topical dad joke that the world can enjoy with him. And some days he's so on top of dad jokes, he's like the Platonic ideal of a dad. All dads can learn a thing or two from him. But other days, Huckabee's insatiable need to lay out sick burns gets the better of him. Here he tried to stick it to Hollywood liberals by going with the comedy gold standard of invoking poop and poop-related areas, but got hung up in the construction. It led a lot of people to ask who had given Huckabee a colonoscopy at the Kodak Theater, and whether they should alert the Los Angeles Police Department. Huckabee wrote this one after Schumer spoke at a Trump travel ban protest held at the Stonewall Inn (where the LGBT rights movement began). It's transphobic, homophobic, and references a transgender man murdered by bigots. It's hard to be both hateful and unfunny, but Mike pulled it off. Huckabee doesn't just reserve his ire for the Democrats. Sometimes he turns his gross and offensive Eye of Saur-pun on his own party, like he did here for a multi-tweet rant. The weenie part makes sense, and pork is a reference to frivolous government spending. Huckabee kind of loses the plot toward the end here, though. With one more jab at his party, Mike takes the opportunity to deploy a transphobic hashtag to really make an impact. Still not letting this one go. 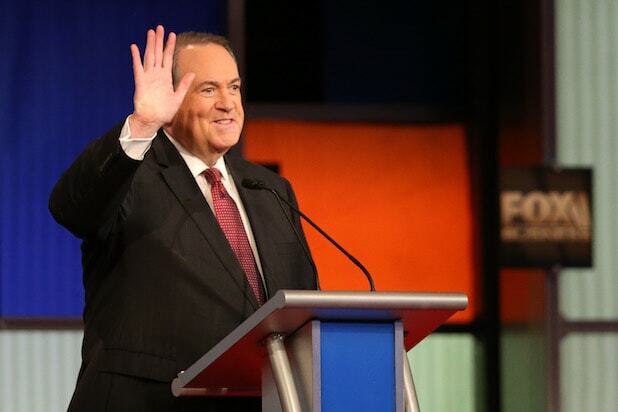 Huckabee has an innate power to look at the news of the day and ask, "How can I make this about me?" He also always has an answer. Only Huckabee sees the real joke in Comey's removal as FBI director -- that what looks like a cover-up is actually everyone else being corrupt. You can almost hear him muttering "Zing!" as he hits the tweet button. On sticking it to the fake news, "CCN"
Mike always has CNN's number, although this time he was in such a hurry to lay down this burn that he got the acronym wrong. He also can't seem to fathom the idea that some Americans might have thought it was wrong for Comey to release his Clinton letter, but also wrong for Donald Trump to fire Comey to kill an investigation he didn't like. On that crazy place, Washington D.C.
A lesser comedian would have said something about draining the swamp. Not Mike, though. He instead makes up all new and confusing euphemisms for political bureaucracy, like a true pro. You might think this is too many racial stereotypes for a single tweet, or a single man. But Mike Huckabee is always up to the challenge. Dunking on the media and a bad pun that makes no sense? Anonymous sources say it's Huckabee's favorite kind of gag.